If you like fruit snacks, they sell Stretch Island Fruit Co. fruit leather- only ingredient is fruit and can satisfy a candy craving. I heard while this is OK, it should be avoid in the first 30 days. I just bought it but some people in other threads tells me to not use it for now. Not sure what the difference is between dried fruit and fruit leathers , but I don't do either. Sugar bombs and snacky. Costco has grass-fed ground beef 4lbs for $17.99 which is cheaper than TJ's or WF. It comes out to about $4.50 per lb. I haven't tried it yet, but will soon. I am leaning more and more towards a costco membership. I have a BJs membership right now because it's a bit more convenient and less expensive, but Costco seems to offer so many things that BJs doesn't. TJs has a new sausage - Smoked Turkey Kielbasa that's actually compliant, much to my great joy. Sadly, I was about to buy a cooked pot roast, which I used to eat all the time, and they've added sugar to it. BUMMER! Also, bought some of the Argentinian wild caught cooked shrimp. Spendy, but a treat for when I feel like I deserve one (replaces chocolate!!) It gets me excited to eat, which can sometimes be an issue - I get into the "but I don't WANNA eat chicken or ground beef" etc. 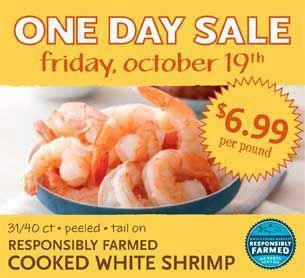 I buy their Wild White Mexican shrimp and they are fabulous. I use them for that exact thing. When I find myself sighing over beef or chicken, I bust out the shrimp. Looking today, they have some chicken sausage that's compliant, too, but be careful. Some are, some aren't. I believe the spicy italian chicken sausage is compliant. Forgot to look for almond butter! It feels so good to have a fridge/freezer full of great stuff! How much were the free range chicken thighs? I saw their organic chickens but I am not sure if I wanna pay $30 plus dollars for two chickens. Darn..I was JUST there. I didn't go to the poultry because I have so much pastured chicken in my freezer. I did find the Wholly Guac though. Perfect when I make lettuce wraps! Oh gosh, I miss Wegmans! I wish they would open some stores in Florida! It's great. We had some as hamburger a few nights ago. I just saw the email about the WF One Day Sale as well - this is great! I prefer to buy my shrimp raw but it would be convenient to just heat them up a salad or toss with some stir fry veggies. I bought cooked shrimp by mistake once. I really don't like re-heating cooked shrimp. However, I have to say, I LOVE LOVE dipping cold, cooked shrimp in mustard and chili paste. I think I could live on it, so it's nice when someone else does the cooking of the shrimp once in a while. That sounds good. I mix tomato paste. lemon juice and horseradish for mine. Not sure my horseradish is completely Whole30 compliant though. I am in between Whole30s at the moment. One of my favorite soups works with this shrimp. Take chicken broth and add onion or leeks and simmer until they are soft. Add a little curry paste, some garlic, and even chili paste if you like it hot, and some coconut milk plus any leftover veggies you might have (spinach and kale work well) and then add a handful of cooked shrimp to the hot soup. No need to heat it up, just let it sit for a few minutes and the shrimp will warm without being actually reheated or cooked further. You guys are awesome. Thanks for all the tips. I work across the street from TJ's. Will have to start spending more time there. OMG I would live there! TOTALLY!! I think I may have a cot there already. I found a 54oz container of Coconut Oil at Costco today - It lists USDA organic, cold pressed. $15. Yup, I bought some too about two weeks ago and I like it, so I hope they continue to carry it. I was at costco today. My favorite new find is frozen cooked langostino. I've been dreaming about lobster rolls lately, so now I will be having a seudo lobster lettuce wrap. I am so excited. I could not find the organic chicken anywhere. I also bought 24 oz of Kerrygold butter to make ghee. It was a great price, but it's salted. I put it in my basket and put it back 3 times. I finally bought it, but not sure I will like the ghee with added salt. I can not find Kerrygold in our Costco! The last time I saw it was around St. Patricks say and not seen it since. Let me know how the lobster is, I saw it the the other day but hesitated to buy it.